Using this wonderful Cars Magento Template you can easily distribute just anything related to autos, whether it’s spares or cars you are selling. Fully responsive layout, hip animations, amazing galleries to showcase your goods, all the forms a good web page must have along with fully functional e-commerce software – these would be only some things you will definitely purchase with this remarkable Cars Magento Theme. Learn more in the live demo. 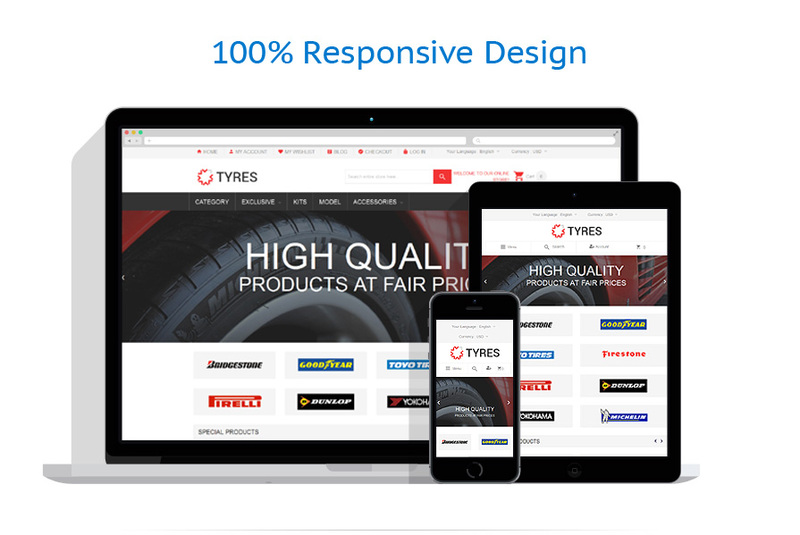 This Tires Magento Theme is tailored specifically to promote wheels and other car parts on the web. Logos of the most reliable manufacturers were placed below the top slider not by chance. Car owners appreciate quality vehicle products, especially with a famous brand on it. Red calls-to-action and badges perfectly draw visitors' attention to the most essential content. Featured and special products are organized in slider galleries for a more convenient viewing. Moreover, the theme boasts a 100 responsive layout, it is SEO friendly and crossbrowser compatible. Good to be used for cars, tools and equipment, electronics, sport, and entertainment stores. Magento is a widely popular eCommerce solution both for huge and small online stores. The popularity of Magento is due to alot of factors, such as the variety of add-ons and features it offers and the templates system it supports. Our Magento themes come for every niche you can imagine and then some! Created by professionals these online store templates are truly responsive and fashionably modern.